Neolithic burials such as this in the Danube Gorges region of Romania and Serbia are providing new insight into the movement of people, and the technologies they carried with them thousands of years ago. Strontium isotope data gathered by UW–Madison anthropology professor T. Douglas Price and colleagues is helping show how agriculture spread in Stone Age Europe. Now, new data gleaned from the teeth of prehistoric farmers and the hunter-gatherers with whom they briefly overlapped shows that agriculture was introduced to Central Europe from the Near East by colonizers who brought farming technology with them. "One of the big questions in European archaeology has been whether farming was brought or borrowed from the Near East," says T. Douglas Price, a University of Wisconsin-Madison archaeologist who, with Cardiff University's Dušan Borić, measured strontium isotopes in the teeth of 153 humans from Neolithic burials in an area known as the Danube Gorges in modern Romania and Serbia. The report, which appears this week (Feb. 11, 2013) in the Proceedings of the National Academy of Sciences, draws on isotopic signatures of strontium found in the tooth enamel of people who died nearly 8,000 years ago, about 6,200 B.C. Strontium is a chemical found in rocks everywhere. It enters the body through diet at or around birth and etches an indelible signature in teeth that accurately documents the geology of an individual's birthplace. "The evidence from the Danube Gorges shows clearly that new people came in bringing farming and replaced the earlier Mesolithic hunter-gatherers," says Price, a UW-Madison professor of anthropology and an expert on early agriculture in Europe. The Danube Gorges slice through the Carpathian Mountains and in the Stone Age were a heavily forested setting, rich in fish and game, including huge sturgeon, catfish, red deer and wild boar. The bends and twists of the Danube in the Gorges region made it especially important as a source of fish, and thus potentially a desirable entryway to Europe for highly mobile and expanding Neolithic communities accompanied by their domesticates — wheat, barley, flax, goats and cattle. The new research, explains Price, speaks to the question of colonization versus adoption of transformative technologies such as farming. "It is also useful because it suggests another route across the Black Sea or up the east coast of Bulgaria to the Danube for farmers moving into Europe. This contrasts with movement by sea across the Mediterranean or Aegean, which is the standard picture." Archaeologists have long wrestled with the question of how farming spread across Europe, ushering in a host of technologies, including the use of pottery, that ultimately led to the rise Western civilizations. Two big ideas have dominated the debate: Did the technology arrive with colonizers from Asia, notably Anatolia or modern Turkey? Or did the technology, including newly domesticated plants and animals, simply diffuse across the European landscape through networks of local foragers? There is some evidence for the importation of early agriculture along the shores of the Mediterranean and in Central Europe, Price notes, "but elsewhere in Europe it is not clear whether it was colonists or locals adopting." Isotopic studies of strontium and other chemicals found in the teeth and bones of Neolithic humans, however, are now helping archaeologists better track the movement of ancient peoples across the landscape. Strontium signatures last not just a lifetime, but potentially thousands of years as tooth enamel, the densest tissue in the body, resists decomposition and contamination after death. 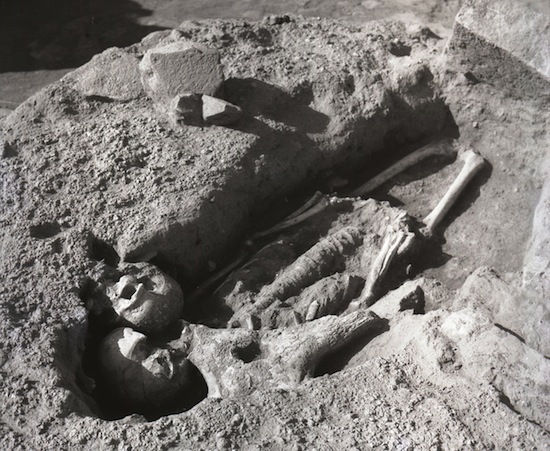 It is now commonly used by archaeologists to determine if an individual was local or foreign to the place where their remains were discovered. An interesting finding of the study is that 8,000 years ago, when Neolithic farmers were beginning to migrate into the Danube Gorges and overlap with Mesolithic hunter-gatherers, more women than men were identified as foreigners. A possible explanation for the variance, according to the study, is that women came to these sites from Neolithic farming communities as part of an ongoing social exchange. In the Danube Gorges, the overlap of colonizing early farmers and hunter-gatherers lasted perhaps a couple of hundred years before the forager societies were completely absorbed by the beginning of the sixth millennium B.C. The new study was supported by the National Science Foundation.